"It is with immeasurable sadness that we write to let you know of the passing of our beloved, heroic, prophetic leader the Rev. Lucius Walker Jr. this morning. We will write with more information as soon as arrangements are made. Please keep his family and his IFCO family in your prayers." 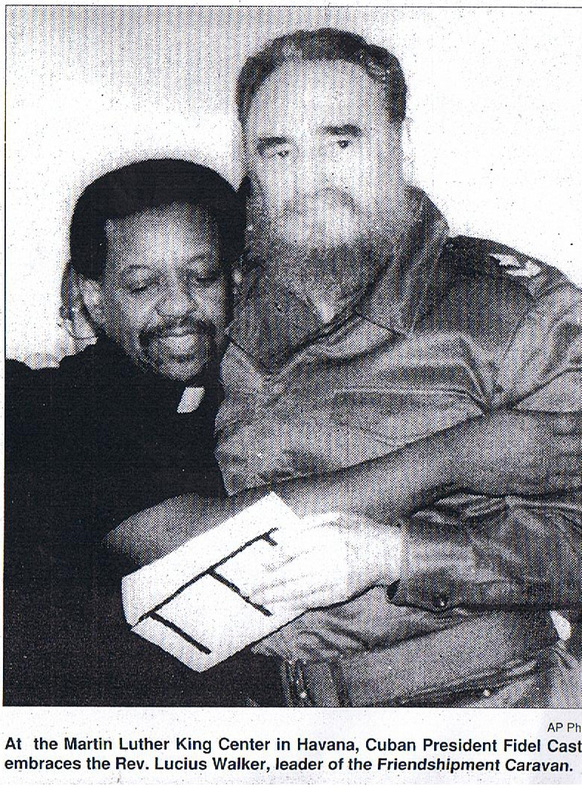 "We Cubans are eternally grateful to Lucius Walker, to IFCO and to Pastors for Peace for their constant struggle against the cruel blockade against our people, and for the liberation of our five compatriots who have been unjustly imprisoned for 12 years for having tried to avoid terrorist actions...Lucius will always be with us, he will be reborn in the struggle until victory." Who was this humanitarian reverend? And why are the left so distraught at his death? Walker has long been involved in leftist organizations. In May, 1964, he was listed as a sponsor of Communist Party USA-front the National Committee to Abolish the House Un-American Activities Committee. In 1967 he founded the Interreligious Foundation for Community Organization, out of which in 1988 was formed Pastors for Peace. Walker served as executive director to both organizations. In 1994, two years after founding the US/Cuba Friendshipment Caravan Campaign which flouted the blockade, delivering aid to Cuba, Walker initiated the International Peace for Cuba Appeal which was affiliated with the Workers World Party-dominated International Action Center. Other initators of the appeal included Cuban Intelligence agent Philip Agee, academic Noam Chomsky, Congressional Progressive Caucus member, Congressman John Conyers and Charles Rangel. The appeal was signed by Alice Walker, Obama appointee Quentin Young, Teresa Gutierrez, and many others. In June, 2003, Walker spoke at a meeting on "US-Cuba Relations" which was held at a Unitarian church in Washington, D.C. In his talk, Walker spoke of "the valiant effort of the Cuban people to maintain free education and health care in the face of the oppressive US blockade. His talk was followed by some in the audience chanting, "Cuba Si, Bloqueo No!" The event was sponsored by the No War On Cuba Movement, a coalition of groups which includes IPS program, Social Action & Leadership School for Activists and the National Lawyer's Guild. Walker also served alongside Howard Zinn, and DSAer Ed Asner on the Advisory Committee for the Independent Progressive Politics Network. Affiliates of the organization include the National Lawyer's Guild, Committees of Correspondence, and the Socialist Party USA. During the recent healthcare financing debate, Walker served on the board of directors for Healthcare Now! Soory to see him go but hey, the devil has a warm welcome for all his followers! Perhaps his friend Castro can take the big step too, with Kim Jung Ilk in tow.